Thank you for your interest in helping families in need enjoy an amazing Thanksgiving holiday. Our mission is to provide a basket containing a complete Thanksgiving dinner to struggling families within our delivery area in order to bring a sense of hope, knowing that their community cares about them. Each basket feeds a family of five a complete Thanksgiving Dinner. The Basket Brigade concept was inspired by Tony Robbins, who grew up in a struggling family, and experienced complete generosity when someone knocked on his door with a Thanksgiving basket full of food, and forever changed his life. This simple gesture of giving turned into the Basket Brigade movement, which delivers these baskets of Thanksgiving Dinners to over 3 million deserving people around the world annually. Link to your business on our sponsor page of our website. 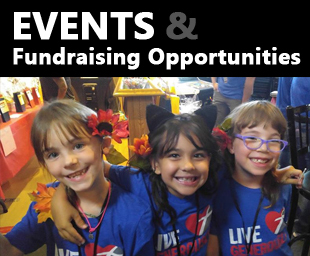 Certified 501(c)(3) so donations are tax deductible. Logo included in footer of all email blasts. 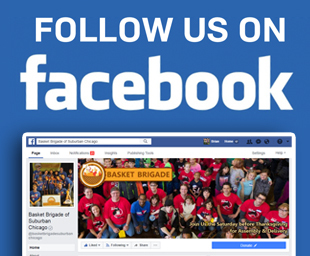 “We Support Basket Brigade” Posters to display at your business (upon request). Opportunity for you and your staff to confidentially nominate families-in-need. Opportunity for you and your staff to be a part of Assembly Day, a truly moving experience. 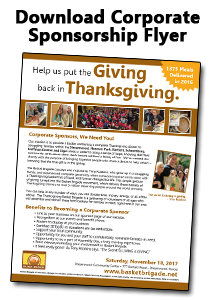 Opportunity to attend “Corporate Sponsors Gratitude Night” for a behind-the-scenes tour on the Friday before our Assembly Day – come meet and take photos with our board members, bring your co-workers and families, and mingle with other like-minded business owners with the same heart for giving as your own. 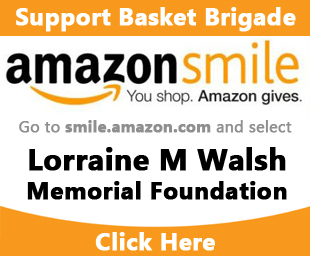 The Lorraine M. Walsh Memorial Foundation is a recipient of a Google Ad Grants award. The Google Ad Grants program supports registered nonprofit organizations that share Google’s philosophy of community service to help the world in areas such as science and technology, education, global public health, the environment, youth advocacy, and the arts. Google Ad Grants is an in-kind advertising program that awards free online advertising to nonprofits via Google AdWords.